The girls along with first mate Reggie take a break on the beach. From Chicago, Louise entered the Chicago Sanitary and Ship Canal and the beginning of the long inland-river road to the Gulf of Mexico. The girls were on their own at last, and they hurriedly fine-tuned the necessary skills that would get them into the Deep South safely. “We definitely learned how to get off the ground,” Smith said. 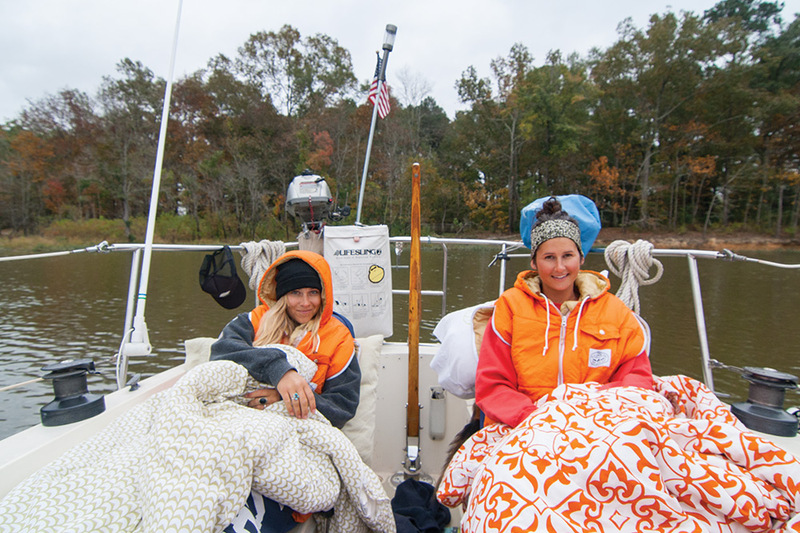 While the girls quickly mastered anchoring, locking through (there are 30 locks between Chicago and Mobile, Alabama), and talking with barges, they did have their initial doubts about the whole enterprise. Smith said her commitment flagged on their first day on the heavily traveled Chicago Sanitary and Ship Canal, which (via the Illinois and Des Plaines rivers) is the only shipping link between the Great Lakes and the Mississippi River. After all, life on board wasn’t easy. A lot of that, Smith said, had to do with not eating or sleeping very well, and the fact that Louise didn’t have heat or air conditioning. They also grew accustomed to sharing such a small living space. “We lived on twin mattresses in Jessie’s 10-by-10 bedroom in Lake Tahoe, so we were used to being in each other’s space,” Smith said.